When a student is first introduced to Walden, it seems that he is told, perhaps rather hastily, that the text and its author are the first of many things. Walden is the ur-text of American nature writing as a genre and its eccentric experimenter is the first American environmentalist. Indeed the critic Lawrence Buell suggests in his essay Thoreau and the Natural Environment that Thoreau in Walden is the first thinker able to move from the distinctly Romantic view of nature which Buell deems “homocentric,” that is, a view of nature which privileges mankind, which asks what nature teaches man about himself and how wilderness can be converted to human uses. Of course, that is not to say that Thoreau didn’t maintain a healthy homocentrism throughout his work; if Walden contains the first distinct elements of “ecocentrism,” or, a view of nature which privileges nature’s “spiritual and material structure for its own sake,” the main haunt of Thoreau’s song is still, like Wordsworth’s, the mind of man (Buell 528). Cut-and-dry distinctions like “ecocentric” and “homocentric,” while mutually exclusive and jointly exhaustive in an abstract sense, cannot be so in any realistic notion, and therefore to call Thoreau the first ecocentric thinker would be as ahistorical as to call Charles Darwin “the father of evolution;” Darwin can only lay claim to the thing called “natural selection,” and Thoreau’s claim is even more tenuous. Walden does not do away with the old and it is not completely new; it evolved as a direct result of its historical moment. If Walden retrospectively appears to have created and influenced a new, more profoundly ecocentric genre called American Nature Writing, the book still owes a large debt to the work of a Romantic homocentric tradition. While the influence of Thoreau on writers like Rachel Carson and Bill McKibben appears obvious, Buell contends that stepping outside of a homocentric worldview was an intellectual challenge for Thoreau. We may notice as readers that Thoreau’s thesis is not “I went to the woods because I wished to save it,” or “to preserve its natural beauty,” but rather, “I went to the woods because I wished to live deliberately,” that is, I wished for it to save me (65). 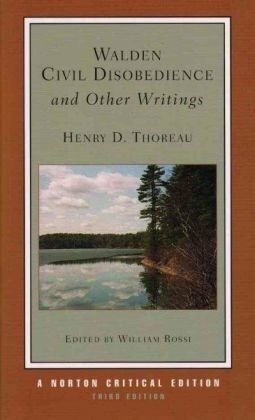 If Walden’s author truly is the first American conservationalist, and his text contains important elements of ecocentrism, it is important to note that homocentrism was a historic view of nature that appears not to have been easily grappled with, and one which was the main impetus for Thoreau’s experiment. If it is difficult for us to imagine the “Father of American Environmentalism” struggling to become the man we now know him to be because the historic views on nature that would have influenced him are now foreign to us as modern readers, we must aim to understand man’s position in nature as Thoreau would have understood it when he first set out for the pond. If then, as Buell contends, Walden acts as a sort of linear development of Thoreau’s thought, with the first chapter, “Economy,” rooted heavily in Thoreau’s personal reasons for his journey to the woods, and the last chapter, “Spring,” acting closer to an ecocentric discourse, then before we may begin to analyze the gap in that development—before we begin to analyze just how much Thoreau’s thought develops throughout Walden—it is important to analyze the historic contexts which inform Thoreau before he writes “Economy.” Such an understanding will allow us to ask: why was this Romantic homocentric view of nature, which Thoreau begins with in “Economy,” so powerful? Is it not noteworthy that scientific views on nature were changing also? That the discourse that led to Thoreau’s development also led to Darwin’s? Only once we obtain a decent history will a comparative close reading of the text’s first and last chapters reveal the extent of the development that occurs between the book’s covers, and aid us in viewing Walden not as some complete conservationalist’s starter’s guide, but rather as a liminal move in the direction of ecocentrism. The history and comparative analysis will aim to display why “Spring” might serve as the intellectual center of the work for the critics that insist upon Thoreau’s being the Father of American envoironmentalism, and in relation to the close reading of the chapter itself, should allow the reader of this piece of criticism to analyze the veracity of these sweeping critical tags historians are so quick to give David Henry. Before we begin with the history, a note: it is not within the scope of this paper, nor my own current knowledge, to provide a complete account of the historic development of nature as an idea before Thoreau, which surely should span several hundreds of pages if properly expounded, as I should someday have interest in accomplishing. I do believe, however, that this overview should be ample; my research into this history includes more than sixty texts, and I believe that a historian’s summary, though this historian’s summary is admittedly incomplete, will serve the purposes of this thesis. To begin then, the questions we must ask are: what did nature look like in Thoreau’s world and how did it come to look that way? In the West, Andrea Lieber notes, “the biblical heritage shared by [Judaism and Christianity] advocate[d] an unhealthy relationship between humanity and nature, one in which human beings [were] destined to conquer the earth and master it” (1). Genesis’ description of man’s place in relation to nature includes this idea of mastery, stating that man has dominion over nature (“Thou hast given him dominion over the works of Thy hands”). Wilderness was thus distinctly othered in this Biblical context; it was man’s challenge to overcome wilderness, and it is therefore unsurprising that wilderness was also the setting of Christ’s temptation. For thousands of years, of course, these Biblical views would have held unquestioned sway, and we should note that up through around 1850, the word “wilderness” still inferred a waste or desolate region and the emotions related to it were terror and bewilderment. Its only distinction from the word “desert” was that the latter was uncultivatable; the difference lay only in the potential utility of wilderness. This opposition: man versus nature, was reflected in the desire to tame wild lands, that is, to put them to human use. The desire manifested in rigid geometric landscape designs like the Italian Renaissance gardens and the gardens they would inspire, like the gardens à la française of the 16th century. Geometrically patterned gardens seem a fine visual metaphor for this practical desire to exhibit man’s influence over nature: not only may man dominate nature, he may force it into unnatural shapes (as Euclid would have told you, geometric shapes were not naturally occurring, and as I might have told you, the idea that man makes unnatural shapes only heightened man’s sense that he stood outside of, or diametrically opposed the natural order). Such an opposition also likely created, what Buell would later call, “the myth of nature’s exhaustlessness,” which he claims still held strength in Thoreau’s day, and which I would claim still holds strength today in climate change debates. The idea was: nature was frightening. It was man’s opponent—that which killed him. Even if man had dominated nature to the point where he exerted absolute geometric force over it, the rivalry certainly was not forgotten, and wilderness still held connotations of fear. The idea was, as Bill McKibben would later state in 1989, that nature seemed a force too huge to be reckoned with. Mankind could, perhaps, tame it for now, in his societies, but to step out of society was something fearful. People didn’t go around looking for “the wilderness experience,” as William Cronon tells us; that experience is something decidedly modern (1). Nature was exhaustless, couldn’t be dominated completely; natural disasters would always strike, so try as he might, man couldn’t control everything. He was, fundamentally, helpless against nature. The only problem was, he wasn’t. That fine geometric patterns could be sculpted from the landscape began to awaken in English thinkers like Sir William Temple and Alexander Pope in the mid-to-late-1600s an idea that “natural beauty” were preferable to one subjected to mankind’s influence. There was, in fact, a tension building between an practical desire to dominate nature absolutely and an aesthetic desire to see “the amiable simplicity of unadorned nature” (Pope, 1). That mankind could appreciate such an aesthetic desire in direct opposition to his rivalry with nature suggests that in day-to-day life, citizens no longer directly feared wilderness; they’d been too far removed from such a time. By 1753, Lancelot “Capability” Brown was England’s leading landscape architect, whose work largely rejected the formalism of former French designs and embraced a natural aesthetic interest, which was heightened by his successor, Humphrey Repton, who added ravines into the “approach” to the family home, and used, occasionally, frightening Gothic architecture. The separation of the “human” space was no longer distinct; man did not need to overtly tame nature in his home, and could instead add elements of the fearsome, or sublime, which Edmund Burke would come to define in 1757 as: the delight derived when danger or pain is viewed from a certain distance, “as we every day experience” (Burke, 7). It seems no longer a mere suggestion on my own part that man felt removed from nature; Burke tells us he could daily experience pleasure at the sight of his former fear, and these landscape architects prove that fear could be enmeshed in the human home, and it would not be fearsome, but rather, sublime. If up to this point, man expressed an absolute homocentrism in regard to nature (nature was only beneficial in the ways it can be converted to human use), now a period of Romantic homocentrism began, wherein, nature’s beauty might be beneficial to mankind’s sensibility, and the things nature had to teach mankind were likewise desirable. This distinction is important; Romanticism was not about preserving nature for its own sake, but rather, continued to center on man’s development. “This was that Earth of which we have heard, made out of Chaos and Old Night. Here was no man’s garden, but the unhandselled globe. It was not lawn, nor pasture, nor mead, nor woodland, nor lea, nor arable, nor wasteland. It was the fresh and natural surface of the planet Earth, as it was made forever and ever,-to be the dwelling of man, we say,–so Nature made it, and man may use it if he can. Man was not to be associated with it. It was Matter, vast, terrific,–not his Mother Earth that we have heard of” (The Maine Woods, 78). And so we begin, with a brief reading of “Economy,” and it is safe to say that Thoreau’s sole haunt here is himself. He apologizes at first for utilizing the first person which was traditionally omitted, but justifies it because he thinks his account may solve many of the problems of his contemporaries’ way of life if his coat fits. Indeed the majority of the chapter deals out sweeping statements about humanity: that men are occupied with superfluously coarse labors, that life’s finer fruits cannot be picked by them, that men lead lives of quiet desperation, that man’s so-called luxuries are hindrances, that farms become encumbrances, that men have never considered what a house is, that our spiritual bread is thinner than our fathers’, et cetera, et cetera. We see very quickly that Thoreau’s principal interest here is mankind; his move out to the woods, we see, and his manner of life develop out of a desire to “spen[d] his time better than digging in this dirt” (40). How to live deliberately, like nature herself, that is all. That is the source of the experiment. By “Spring,” however, we see something different. We see a year in the woods, we see ten years of manuscript editing (Buell notes that Thoreau edited the latter part of the book more heavily than the former), and we see a man whose careful documentation of pond phenomena and animal life mimics not only the Romantic natural historians, but also his materials lists, his costs, his wages—his concerns, from “Economy.” Certainly one of the most telling lines shows us that Thoreau has at least considered moving man down from his position of dominion over nature, in which he states: “Men seeing the nature of this man like that of the brute, think he has never possessed the innate faculty of reason” (212). Thoreau’s sentence reflects an ubiquitous teaching from philosophical texts: homo est animal rationale, man is a rational animal, and subverts it, stating that man is perhaps not separate from beast—here he does not miss Darwin’s mark by very much. This realization allows him to treat the land as if it had emotions—“Who would have suspected so large and cold and thick-skinned a thing to be so sensitive?” (203), and tries to decipher, like Champollion, its language, for its own sake (207). He catalogues the geese as he formerly catalogued his food, and yet here, I think, the most important change is revealed: he admits to waiting for these birds to come, and says that one of the principal reasons for coming to Walden was to be able to see Spring, with its geese, come in—to appreciate, like the homocentric Romantic, the beauty of these creatures—yet as the geese come in and notice Thoreau, he retires to his home, so as not to frighten them (210). If Walden does not loudly sound the preservation horn, then here is a moment where Thoreau identifies the fragility of nature and empathizes with it. If Thoreau othered Walden Pond as his homocentric predecessors did—if he set up Walden Pond as a Natural sanctuary, outside of himself, in which he might learn how to live deliberately, like it, despite contrary evidence which Thoreau was aware of (the railroad running through, the deforestation issue), that is: if Thoreau fell prey to the “myth of nature’s exhaustlessness,” then by “Spring” he has finally made some peace with the notion that mankind can negatively affect nature. Thoreau retires to his home for the sake of the geese. These animals are, here, in these few sentences, important; Thoreau does not have the right to frighten them off for his own appreciation of them. He gives, however briefly, certain rights to these geese, which will be amplified 100 years later in Leopold’s Land Ethic, and so, it is true, here, that we may begin to see the roots of ecocentric thought in Walden. Walden was, certainly, a principal step towards the ecocentric discourse that pervaded the genre of American nature writing and climate change literature of today. It developed out of and was deeply enmeshed in a culture of homocentric relations to nature which came before it, and that is the point, that relationships are never cut-and-dry, but are consistently different and developing. If Walden was a principal, influential text upon the way we began to perceive nature, so much the better for its creation, but it could not have been created outside of the time, the place, and the history which influenced it. Want more criticism on nature writing? Try my piece on A.S. Byatt’s Morpho Eugenia! This entry was posted in 19th century, American Nature Writing, Charles Darwin, Darwin, David Henry Thoreau, ecocentrism, evolution, Great Chain of Being, Henry David Thoreau, homocentrism, Literature, Nature Writing, Romantic Natural History, Romanticism, Thoreau and tagged 19th century, American nature writing, Charles Darwin, Darwin, David Henry Thoreau, ecocentrism, evolution, Great Chain of Being, Henry David Thoreau, homocentrism, Literature, nature writing, Romantic Natural History, Romanticism, Thoreau. Bookmark the permalink.